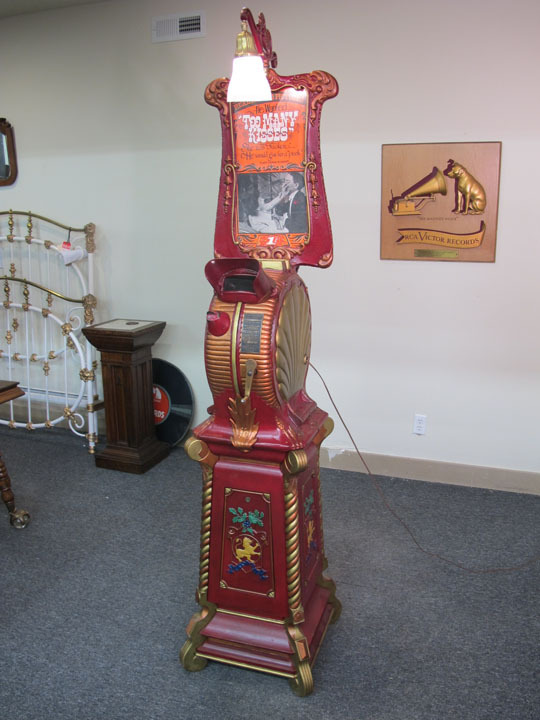 Period Reel and Marquee Entitled "Too Many Kisses"
Very Impressive Early Coin-Op Machine! The first patent on the Mutoscope was issued in 1895. The inventor was Herman Casler of Oneonta, New York. He worked at C.E. Lipe Machine Shop in Syracuse, NY where the first prototype was built. There was some controversy about whose idea the Mutoscope was originally as an associate of Edison stated that the idea was his. Eventually Casler and this person - W.K.L Dickson, were joined by some other people and they formed what became the American Mutoscope Company and then later the American Mutoscope and Biograph Company located in New York City. The camera was called the Mutograph and the projector was called the Biograph. This was the forefather to motion pictures, and was forgotten when people started viewing motions pictures. Card-flipping thumb books had been used for years, but the circular card reel was a new invention. The time it took for one rotation was about one minute. This was the same length of a standard thirty foot film by the cameras of the time. The Mutoscope reels were produced from 1897 to 1907. In that time more than 4,000 titles and 100,000 reels were printed. There are only about 500 existing today. Be one of the few to own this great piece of history today!